December 5, 2011 Update: The Access Board’s public rights-of-way rules discussed in this post are now available on the Public Rights-of-Way Homepage on the Access Board website. In the most recent example of federal agency sluggishness in getting regulations finalized, the public comment period for these regulations was recently extended. Public comments are now due on February 2, 2012. Comments may be filed on the Regulations.gov website. Original July 13, 2011 Post: The United States Access Board has announced that it will at long last publish the proposed Public Rights-of-Way Guidelines on July 26, 2011 – the 21st anniversary of the Americans with Disabilities Act. The guidelines are expected to address a wide range of issues relating to access to sidewalks and streets by people with disabilities, including accessible pedestrian signals, crosswalks, roundabouts, curb ramps, street furnishings, parking, and other components of public rights-of-way. Technical specifications and guidance on these issues will be welcomed, but it is important to remember that the Americans with Disabilities Act has required such access for more than twenty years. The proposed guidelines will be posted on the Access Board website and will be available for public comment for four months. More details will be available here after July 26. You can also follow the Law Office of Lainey Feingold on Twitter for up-to-date information. The proposed guidelines will be issued against a backdrop of long standing advocacy by the disability community to ensure accessible streets and sidewalks. Structured Negotiations about Accessible Pedestrian Signals (APS) and litigation about accessible sidewalks discussed below are examples of that advocacy effort. These legal initiatives were successful because, while guidance and technical assistance from the Access Board is valuable, the Americans with Disabilities Act has, since its passage in 1990, required that streets, sidewalks and intersections be accessible to people with disabilities. The law has also long required that safety and other information provided by public entities to sighted pedestrians be effectively communicated to pedestrians who are blind. 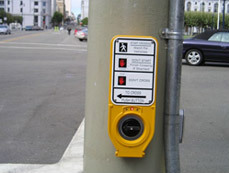 in 2007 San Francisco announced an historic and significant program to install APS in the City. The announcement was the result of a successful Structured Negotiations between the City and the LightHouse for the Blind and Visually Impaired, the California Council of the Blind, and the Independent Living Resource Center. Linda Dardarian of the Oakland civil rights firm Goldstein, Demchak, Baller, Borgen & Dardarian and the Law Office of Lainey Feingold represented the blind community in these negotiations. Technical support for the San Francisco APS negotiations was provided by Gene Lozano, of the California Council of the Blind, and by Beezy Bentzen and Janet Barlow, principals of Accessible Design for the Blind, a consulting group with deep expertise in pedestrian safety issues for persons with disabilities. A wealth of information regarding best practices for several of the issues expected to be addressed by the Access Board in its proposed guidelines is available on the Accessible Design for the Blind website. Visit the Accessible Design for the Blind website. 2010 press release announcing expansion of the City’s APS program. In 2004 a successful litigation by Disability Rights Advocates (DRA) set a nationwide precedent requiring cities and other public entities to make all public sidewalks accessible by addressingmissing or unsafe curb cuts throughout the public sidewalk system, as well as barriers that block access along the length of the sidewalks. Read about the 2004 sidewalk access case on the DRA website. In 2009, DRA announced another sidewalk access agreement, this one with the California Department of Transportation (CalTrans). Under that agreement CalTrans is required to allocate millions of dollars each year for sidewalk accessibility enhancements. Read about the CalTrans accessibility case on the DRA website. The history of the proposed guidelines that the Access Board will issue on July 26 can be found on the Access Board Public Rights-of-Way Page. The rulemaking history for the 2011 guidelines (which will still only be proposed) began in 1992 when the Access Board sought to include rules on rights-of-way issues in the initial ADA Accessibility Guidelines. After revisions, public meetings, public study, advisory committees, reports, and draft guidelines, revised draft guidelines were published in 2005. The guidelines coming on July 26 will no longer be “draft”, but they will still be “proposed”, leaving room for comment and further changes. July 26, 11:00 – 12:30 Eastern Time: Public Briefing and Press Conference about draft regulations at the Board’s meeting space at 1331 F Street, NW, Suite 800, in downtown Washington, D.C.
August 9, 12:00- 1:30 Eastern Time: Free Webinar to review the proposed rule and to discuss subjects where input from the public is sought. Visit the registration page for the Access Board Webinar. Further information about these events will be included in the rule that will be published on July 26.